A Rinkya Blog: OLIVIA Guitar Charity Auction Winner Interview! Q: What prompted you to bid on Olivia’s Guitar? A: I found & noticed a posting on an internet Olivia fan community. Q: Are you a guitar collector, musician, or an Olivia fan? A: I’m a pure OLIVIA fan. I am a fan from the time when she debuted with D & D.
Q: Do you have a favorite Olivia Album or CD? A: It is hard to choose one because everything is my favorite. Q: What does it feel like owning her guitar? 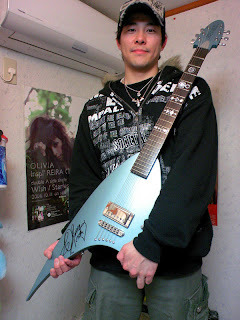 A: I am so glad to to own the guitar that actually she touched!! And the fact that there is only one in the world makes it even more special. Q:Are you going to learn to play it or put it on display in your home? A: I have no interest to practice or play. I will display it in my room because it is so precious to me. Q: If you could meet Olivia what would you like to say to her? A: I would like to keep sending my support and thank her for the times her songs helped me through the hard times, when I was depressed and down. Thank you for your time Makino and we hope you enjoy your prize. Your generosity may turn out to be a gift for a future unknown young Asian-American Star. I really appreciate that you gave me the best guitar that exists and is the only one in the world.